House Bill 2221 and Separation of Powers. 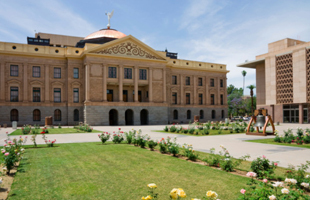 Article III is the separation of powers provision of the Arizona Constitution. It states: “The powers of the government of the state of Arizona shall be divided into three separate departments, the legislative, the executive, and the judicial; and, except as provided in this constitution, such departments shall be separate and distinct, and no one of such departments shall exercise the powers properly belonging to either of the others.” Generally, the so-called separation of powers doctrine is intended to prevent one branch of the government from overreaching the other coequal branches. Read the the entire legal memo here. ← Voluntary Bar Legislation Moves Past Judiciary Committee 4-1.